I saw your blog article featured on today’s asp.net community standup. I too am a big fan of placing all the UI related files together rather than spreading them out over many directories (views, controllers, viewmodels, etc). Thanks for the comment, Ron. Appreciate you taking the time. I like where your head’s at with that proposal. Only thing I don’t like is the controller would be repeated for each view that’s part of your controller, right? Like it would show under Create.cshtml, Edit.cshtml, etc. (in the standard CRUD views). Might be a little confusing, because right now a file only shows up one time in Solution Explorer. Again, I appreciate what you’re going after though. I really like your idea of having a shortcut to the View Model when you’re in a view. A lot of times I just scroll to the top and peek definition if I need to tweak the View Model and the file’s not open already. Commented as such in your GitHub issue. The Controller has always been a bit of an odd duck as to where to put it and what to do with it, so I feel your pain there. My screenshot has the Controller in the Features folder with the rest of the front-end, but some like to have a Controllers folder to separate it out under the Features/FeatureName/Controllers or something like that. I hear ya Scott. if a person is really creating separate views for inserting, updating and viewing a record then I can see how they wouldn’t want three controllers for that. But I think it begs a more fundamental question which is: should there be separate views for viewing, creating and editing to begin with? In most cases the views for creating and editing are nearly identical and the view for viewing is again just about the same except that the fields are not editable. To me this totally violates DRY. Such an approach means that when a developer wants to add a field to a view model that field has to be added to three separate views just for basic CRUD operations. I know that’s how the default scaffolding works in Visual Studio for MVC, but it’s never made any sense to me and I don’t do it that way. I think a much better approach in most cases is to have a single view that can handle inserting the record, updating the record and viewing it. And that view is handled by it’s matching controller. 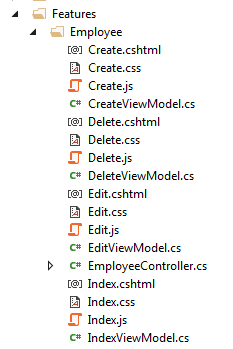 In such a world it starts to make sense that a view, controller and view model are a trio that work together and belong in the same directory. And in such a world, Visual studio should have hot keys for jumping from any one of the three to the other two. I hope my approach makes more sense now. Agree 100% on trying to limit views and provide a better UX. I usually go that route as well (as always, it depends), but I just chose the CRUD views as a simple example. I just don’t find myself only having 1 View in a Controller in general. Good post, thanks for sharing. However I always struggle with naming things. Naming is hard, but it’s a super important aspect of organizing a bunch of abstract concepts into something that is intuitive and easily manageable for the developer and user. Why is this pingpack connected to my comment? I find the headline of his linked page offensive. That’s a great question, Josef. I’ve never had the need for that. Read your post though, great solution. Based on your example, it seems like the “HeadingBlock” could be a View Component in ASP.NET Core land, which is the replacement to Child Actions, which I used (and abused) in previous MVC versions for components-like things like reusable components and just separating logic on non-reusable components such as navigation. I’ve got a link to View Components above, but here it is again: http://docs.asp.net/en/latest/mvc/views/view-components.html. I’m not sure if View Components are a great fit for your scenario though, as I’m not certain what HeadingBlock does. Thanks for the comment and sharing your blog post! That’s useful. Thanks for sharing, Christian! What you do is just change the name of Views folder and then move Controller/css/js to that folder, don’t you? We can keep the old name for Views folder and get nearly the same result without Expander class and having full support for future. The only “problem” is that our Features folder is called “Views”. Is ireally a problem? As someone who likes meaningful names… yes it is a problem to me. 🙂 It’s easy enough to configure and it’s most definitely supported for the future. They provide this override specifically so you can do things like this. That said, the folder name is less important than the overall of idea of grouping your tightly coupled pieces together. I love the Feature folders approach! How do we serve the js files in the feature folders without a 404? mojodk – That’s a good question. There are a few different options, but the ultimate idea is you’re going to need a tool to bundle up your code and put it in the wwwroot folder. I like to think of the wwwroot folder as the “bin” folder, and treat it just for output, not the original source code. If you’re using Feature Folders in ASP.NET 4.x apps and not ASP.NET Core apps, you could use the BundleConfig. More on that here: https://docs.microsoft.com/en-us/aspnet/mvc/overview/performance/bundling-and-minification . Hi Walter – thanks for the comment. That’s a good point, you will need that if you have the specific path spelled out in your project.json. I just typically follow what the default templates do which is “**/*.cshtml”. I think one of the earlier templates had “/Views/**/*.cshtml” hardcoded in before they changed it. You shouldn’t need anything special with .csproj files now that VS 2017 and the 1.0 of the tooling have RTM’d. RIP project.json. 😦 I liked it, but also like the new .csproj changes. !!! This is awesome! Thanks for sharing Bill. I’m using CQS here and was making 1 call per controller (since you can break them up and still have the routing work fine) givins us true SRP through the entire chain.